RJ Cooper has provided accessibility devices and software with special needs students for many years. As the cheese moves so has RJ Cooper, creating specialized apps for mobile devices that support students with physical and cognitive challenges. 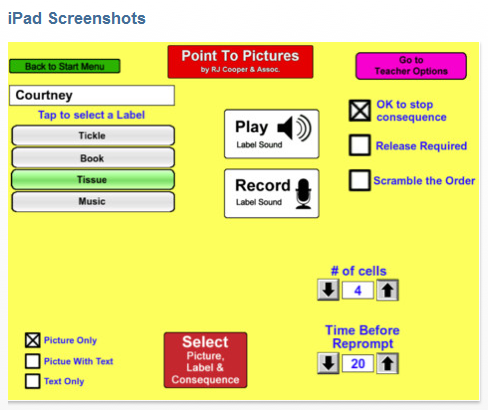 Point to Pictures is just one of his apps for communication with customizable features and currently Free from iTunes!! Just last week one of the speech pathologists was looking for something that could be used for presenting information on an iPad in the regular education classroom with one of our students with PDD – I believe would have been a great solution! The Point to Pictures app seems to be a flexible app, used as a choice board or communication board for students needing visual communication as well as working on basic communication needs. Although our speech and language pathologists typically establish the communication supports for our students, developing visual communication for functional life skills and working on developing skills to access devices is a part of our OT job. RJ Cooper describes the Point to Pictures as an augmentative communication “training” app designed for those persons “learning” to point/select a picture on an iPad in order to “get” that item in real life. I have a couple of student who are in need of those pointing and selecting skills as we begin to use iPad for their visual communication to perform functional tasks at school. 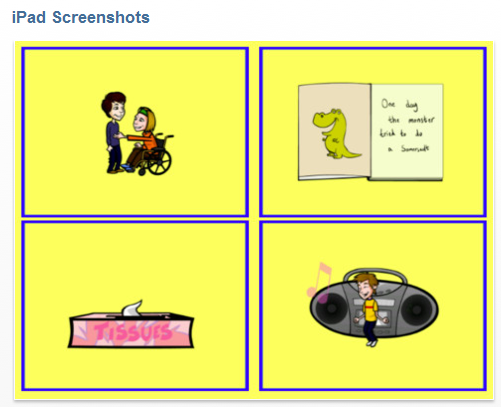 Point to Pictures provide the type of customizable features that will support the students and is free! Free and available for iPad only, I am looking forward to using this app with specific students on an iPad2 with familiar pictures taken of places and equipment at our school. Have you used it? Any tips and tricks you can share? 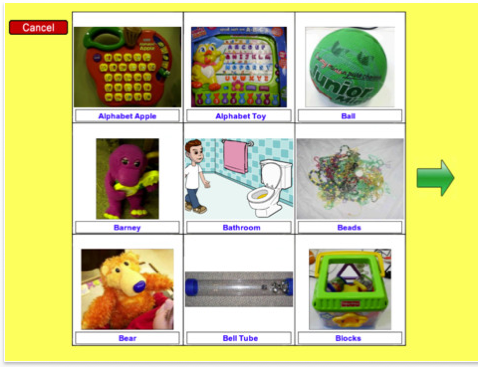 This entry was posted in App Reviews, Apps for OT's, Apps for Special Needs, Augmentative Communication, iPad, Occupational Therapy, Special education, Visual Communication and tagged App Review, Augmentative Communication, iPad, occupational therapy, special education, special needs students, visual communication. Bookmark the permalink.